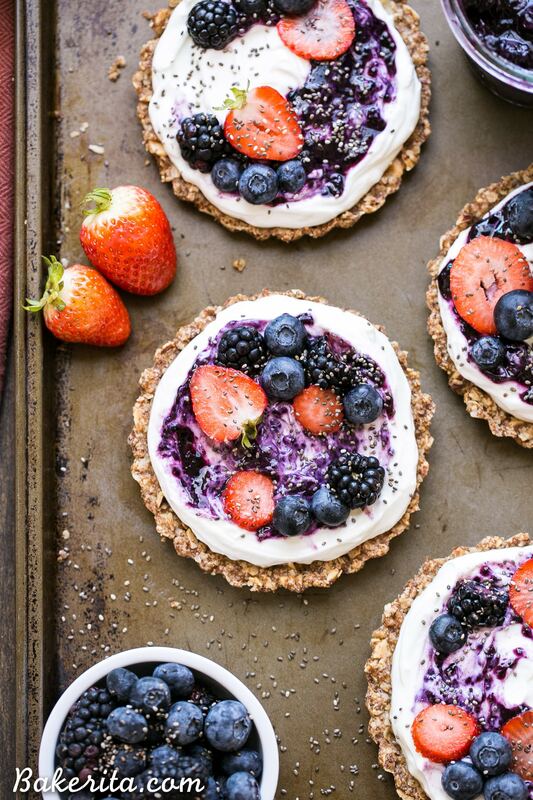 These Granola Crust Breakfast Tarts are topped with Greek yogurt and fresh berries for a fun and filling breakfast! This gluten-free and refined sugar-free twist on a classic parfait looks beautiful and tastes even better. I have a granola infatuation, and I’m constantly dreaming up new flavors and new ways to use granola for every purpose. If you’re a regular around here, that’s no surprise – you’ve seen a whole bunch of granola recipes over the years. 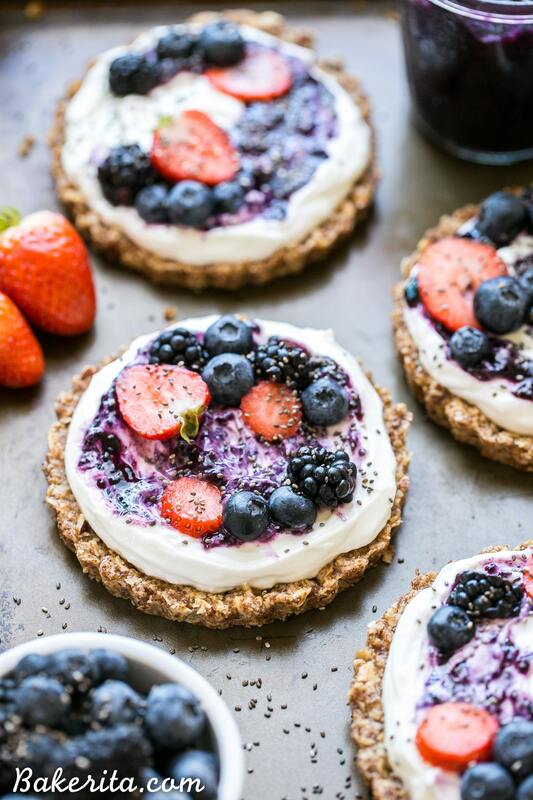 To be honest, I’m surprised these granola crust breakfast tarts haven’t come along sooner, considering they have a whole lot of granola goodness going for them, and they’re a twist on my favorite breakfast: Greek yogurt, berries, and homemade granola. For me, it doesn’t get a whole lot better than that…especially since I don’t eat eggs for breakfast, and Greek yogurt is the next best way to get my protein for the day. Also, the crust to filling ratio is on point for a granola lover like me – the granola crust means you get a whole bunch of granola in every single bite. Swoon. The granola crust is made a bit differently than regular granola to help it hold together, while maintaining that classic warm granola flavor. Instead of rolled oats, I used quick cooking oats. I tested the recipe both ways and the smaller quick oats definitely held together better in the crust – the rolled oats made for a less firm, more crumbly crust. If you only have rolled oats, I’d recommend pulsing them just a few times in a food processor or blender to break them down a bit. In addition to the classic oats, almond flour and tapioca flour help the crust get super crispy, while also giving some structure to the tart crust so they’ll hold up when you take them out of the pan. Coconut sugar, salt, and cinnamon add a hint of sweetness and warmth. Coconut oil is my fat of choice here, and it’s incorporated into the dry ingredients in solid form, worked into the flour similarly to the way you would for a crumble topping. Finally, finely chopped pecans and almonds add that nutty crunch that granola just needs. It is really granola if there’s no nuts involved? Once the granola tart crusts are baked in their cute little tart pans, you’re pretty much done with the hard work. From here, you can make and serve the tart immediately, or store the granola crusts in the refrigerator or freezer until you’re ready to eat. I recommend assembling these fresh, right before you want to eat them, for the best results, although you can make them about a day ahead of time. They’re so easy to put together, though, so do it the day of. When you’re ready to eat, grab a crust, top with a big scoop of Greek yogurt, swirl in your favorite jam (if you want! ), and top with loads of beautiful fresh berries. Ta-da! Your beautiful breakfast tarts are served. Make these all at once and serve for a brunch get together, or make the granola crusts and stock them in the fridge for a quick-to-put-together breakfast on rushed mornings. And if you’re into not-too-sweet desserts? These breakfast tarts can star at the end of your day, too. Enjoy! Preheat oven to 325ºF. Prepare four small tart pans by greasing lightly with coconut oil. Set aside. In a mixing bowl, combine the almond flour, tapioca flour, oats, coconut sugar, salt and cinnamon. Add the coconut oil and using a pastry cutter, two forks, or your hands, work the coconut oil into the flour until it comes together into a course meal with no dry flour remaining. Toss in the sliced almonds and pecans. Divide the granola crust evenly between the four prepared tart pans and use a flat-bottomed measuring cup or glass to press the crust evenly along the bottom and up the sides of the pans. Place on a baking sheet and bake for 12-15 minutes, or until firm to the touch and browned. Let cool completely. 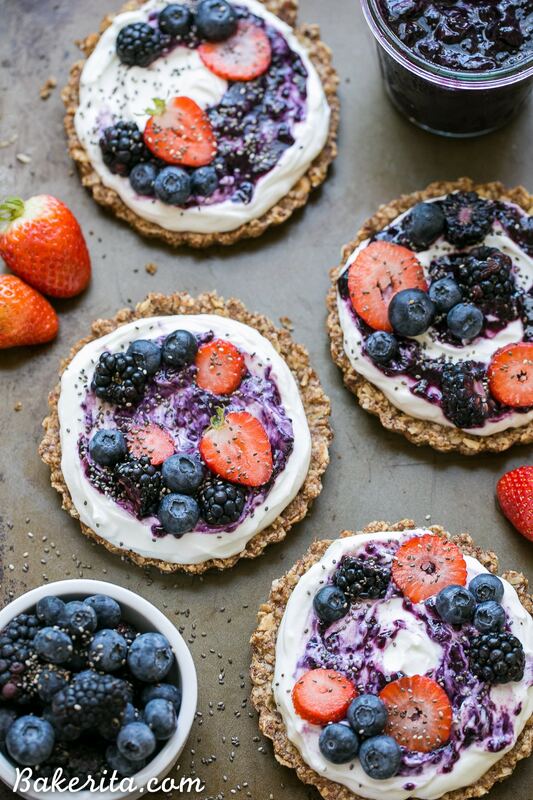 Immediately before serving, top each tart with 1/2 cup Greek yogurt. Swirl about 1 tablespoon of jam onto the yogurt and top with 1/4 cup mixed berries. Enjoy! Ahh yess they are! Isn’t it the best breakfast ever?! Thanks, Bethany! How gorgeous are these?! This is such a great idea, Rachel! 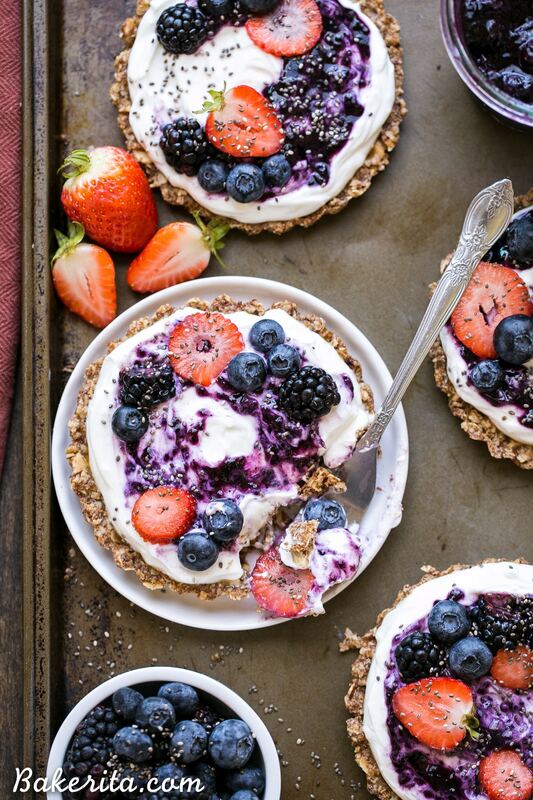 I love granola too, so making granola tarts with yogurt and berries is such a fun way to jazz up a regular parfait. And your pictures are just gorgeous!! These are way better than the cereal I had this morning! SO gorgeous, and packed with allllll the things you need on a Monday morning! I love using coconut oil and almond flour for baking. This looks delicious! I’m a granola fanatic too, and I have a granola tart recipe that I haven’t made in ages! 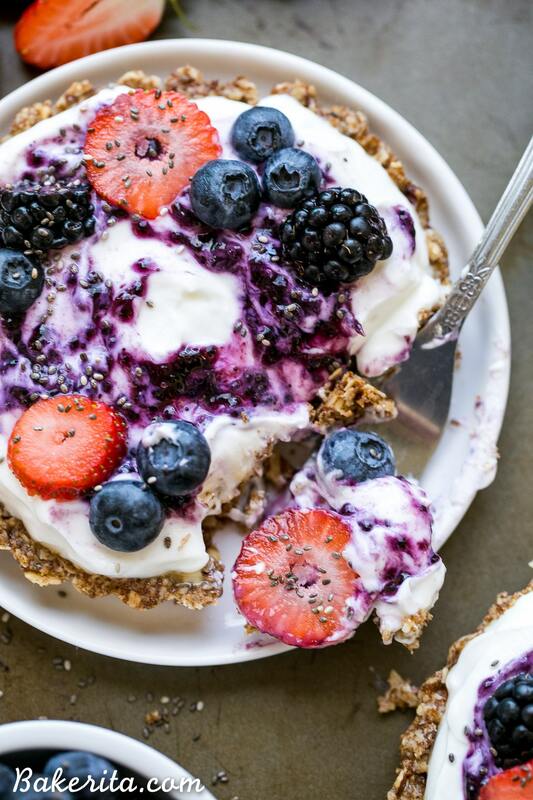 I love this healthy granola crust and all those sweet berries — this is such a fun summer breakfast! Please can you confirm, do you really mean almond flour or do you mean almond meal or what we would call ground almonds in the UK? Hi Penny. The almond flour has not had the fat removed, if that’s what you mean, but it is referred to as almond flour in the U.S. Here is a link to the kind I used in this recipe: http://amzn.to/2bN5ETx. Hope this answers your question! Assembly line style is a wonderful idea! Thanks, Ricky. These tarts are so pretty! I’m not sure if I want them for breakfast or dessert! Seriously, this is pure genius! A healthy breakfast that looks like a dessert is the greatest thing I’ve seen in a long time. Not to mention these pictures are gorgeous Pinned and definitely making these ASAP! This granola crust is brilliant! What a great idea. And who could be in a bad mood after having a tart for breakfast? 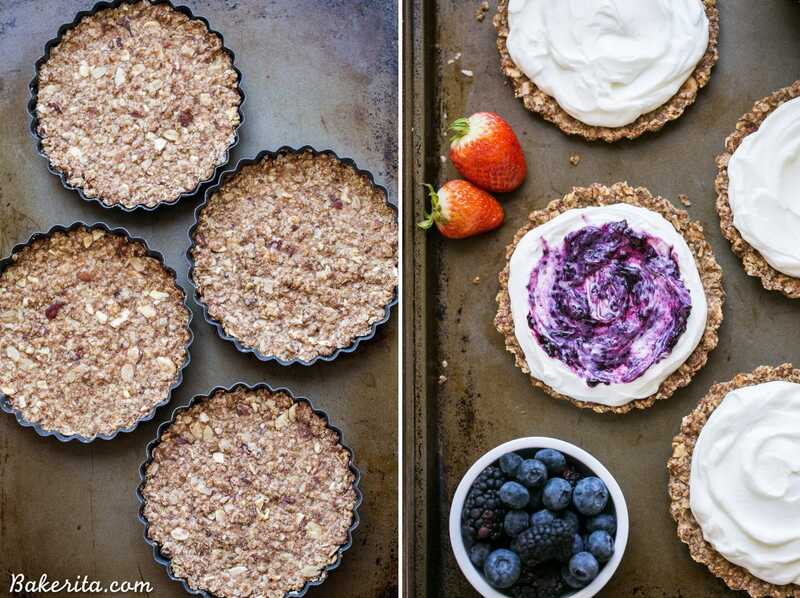 These granola breakfast tarts look phenomenal!! I didn’t think I was a huge granola fan until I went through a bag in a shorter time period than I’d like to admit. It goes with everything!! Love this mashup. These look absolutely INCREDIBLE Rachel!! I’ve been in such a breakfast rut too. Pinning for later! I just made something very similar to this but your’s looks so much better. Love all the fresh berries on top! What a great idea for breakfast Rachel! I love, love, love those little granola tart crusts! Getting these on the breakfast menu ASAP! These look SO good Rachel! I love the idea of have oats and yogurt together like a breakfast dessert :) The jam looks so yummy too! I can’t remember what I was singing but it was definitely a happy moment in the kitchen! I’m so happy you like it, Alisa! Is there a nutritional breakdown available for this recipe? Thank you! Hi Deb, nutritional info can be calculated on myrecipepal.com! I just have rolled oats at home. Do you think it’ll turn out as well as using quick oats? Do you suggest I grind them in a food processor? Hi Hena, it would probably help to pulse the rolled oats a couple times in the food processor to break them up, which will help them hold together a little bit better. Enjoy! Is it possible to substitute almond flour for other flour, e.g. coconut or even oat? Hi Natalia, oat flour would probably be best since coconut flour is so absorbent! Enjoy. Could I try baking this without the tart pan? If so, how? These were fabulous, quick and easy to come together and reminds me of the days I used to eat granola cereal! Super tasty and kid approved!! We topped ours with Greek yogurt and squished banana along with berries!! Filling breakfast which was another plus!! Yay no eggs! !